Leys was reviewing a book written by Father Laszlo Ladany, a Jesuit priest living in Hong Kong, who 'with good reason' was acknowledged as the doyen of the 'watchers'. Xi Jinping undoubtedly emerged the winner on most fronts. First and foremost, the 19th congress approved an amendment to the party constitution enshrining the 'Xi Jinping Thought on Socialism with Chinese Characteristics for a New Era'. Though the new central committee and central commission for discipline inspection are more or less along expected lines, the politburo and the standing committee of the politburo brought some surprises. 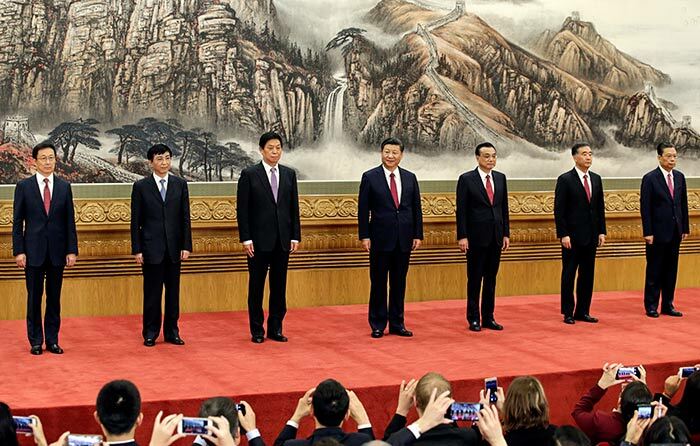 The new standing committee now comprises Xi Jinping, Li Keqiang, Li Zhanshu, Wang Yang, Wang Huning, Zhao Leji and Han Zheng. The presence of Li Zhanshu, Xi's chief of staff, who is to take over the chairmanship of the National People's Congress is proof of Xi's control over the appointments. Ditto for Wang Huning, the party theorist who should take the charge of ideology, propaganda and party organisation, while Zhao Leji will replace Wang Qishan as the new anti-graft tsar. Wang Yang will replace Yu Zhengsheng as chairman of the Chinese People's Political Consultative Conference. A noticeable absence is Chen Min'er, the party secretary of Chongqing, who in many quarters was expected to be anointed Xi's 'heir apparent'. Apparently Xi did not want a 'successor' as yet. The great surprise was that Wang Qishan, who is responsible for making thousands of heads roll in the party, has stepped down from the standing committee, due to the age limit norm. It was confirmed when his name did not appear in the list of the new central committee members. Many 'watchers' expected Xi to break the unwritten retirement age rule (party leaders retire when they turn 68) to keep his friend and colleague Wang on the standing committee. Two members of the powerful Central Military Commission made it to the politburo. Apart from Air Force General Xu Qiliang, presently the CMC vice-chairman, General Zhang Youxia, a family friend of Xi, was selected as the second vice-chairman. Adding Xi's name to the party constitution brings him at par with Mao Zedong and Deng Xiaoping. Xi now dreams to make China into a great Socialist power by 2050. Xi promised that China, under his leadership, would be an upholder of world peace and stability; his announcement that the Middle Kingdom was ready to play a greater role in building 'a common destiny for mankind', is taken by many with a pinch of salt. In a resolution approved by the congress, Xi's military thinking and the party's 'absolute' leadership over the armed forces have been included in the constitution. The Belt and Road Initiative, also known as One Belt One Road, is now mentioned in the constitution. The congress agreed that 'following the principle of achieving shared growth through discussion and collaboration', the Belt and Road Initiative should be named. India has objected to the fact that a segment of the OBOR travels through Pakistan occupied Kashmir. The inclusion of the OBOR will not solve this issue; on the contrary, it could be further exacerbated. The revised constitution says that the Communist party must make comprehensive efforts to ensure that 'the fight against corruption keeps going'. On October 18, Xi called corruption 'the greatest threat' that the party faces. The party will soon adopt a national anti-corruption legislation and create a corruption reporting platform which will cover both disciplinary inspection commissions and supervision agencies, Xi said. Contrary to what many have written, Xi might not be all powerful; he still has to deal with party norms and traditions. He has been careful not to break the age rule and to follow the order of seniority. These political norms are critical for the 89 million member Communist party to have consensus at the top and maintain stability, the South China Morning Post noted. Another sign that Xi may not have full control is the reduced size of the Central Military Commission which has only 7 members (apart from two vice chairmen: Xu Qiliang and Zhang Youxia, the others are Wei Fenghe, Li Zuocheng, Miao Hua and Zhang Shengmin) compared to 11 in the previous congress. When the list of the delegates to the congress was first released in July, many observers thought that it would mark a new area for women who made up 24.1 per cent of the 2,287 delegates. But Chinese women leaders are still practically excluded from the top of the hierarchy. Of the 204 members of the central committee, just 10 are women; the same figure as that for the 18th congress of 2012. And only one lady, Sun Chunlan, made it in the politburo. She will probably retain her job as chief of the United Front Work Department. That is disappointing. As for the ethnic minorities, they have got a slightly better deal in the central committee, with 16 members of ethnic origin compared to only 10 five years ago. Incidentally, the Tibetans have four representatives and have been selected as members of the central committee (Lobsang Gyaltsen and Che Dalha) and alternate members (Norbu Thondup and Yan Jinhai, a Tibetan from Qinghai); it is a first. Further, Wang Huning, the newly appointed member of the Standing Committee of the Politburo, will probably represent Tibet at the National People's Congress in March. The question is why a Han leader should represent Tibet; Han chauvinism will continue for some time more. In any case, Wang's presence does not mean that life will become easier for the Tibetans or the Uyghurs. Chen Quanguo, the former party Tibet secretary, presently posted in Xinjiang, has been rewarded with a seat in the politburo for the repressive measures that he introduced in the restive Muslim region. As Deng Xiaoping liked to say, 'Let us seek truth from facts'. As it was true 30 years ago, it is still not easy to read the future of the Middle Kingdom in tea leaves.